SOUNDS TO ME LIKE THERE’S A SCUFFLE GATHERING, OUTSIDE OUR SPEAKEASY! WELL WHO’S GOING TO GO DEAL WITH IT? I DARESAY I’M THE BEST SUITED, I’D GIVE THOSE RUFFIANS A BIFF! OH YEAH? I’D GIVE THEM A BIFF, AND A WHACK! CHIN MUSIC is a game about boasting big, making threats, then going outside and showing the gathering ruffians what for! designed for two to six players. You and your friends get to brag big about how well you’ll crush the opposition, and then one of you has to step up and prove it, plowing into the crowds outside with your knuckles out and your braggadacio ready to go! 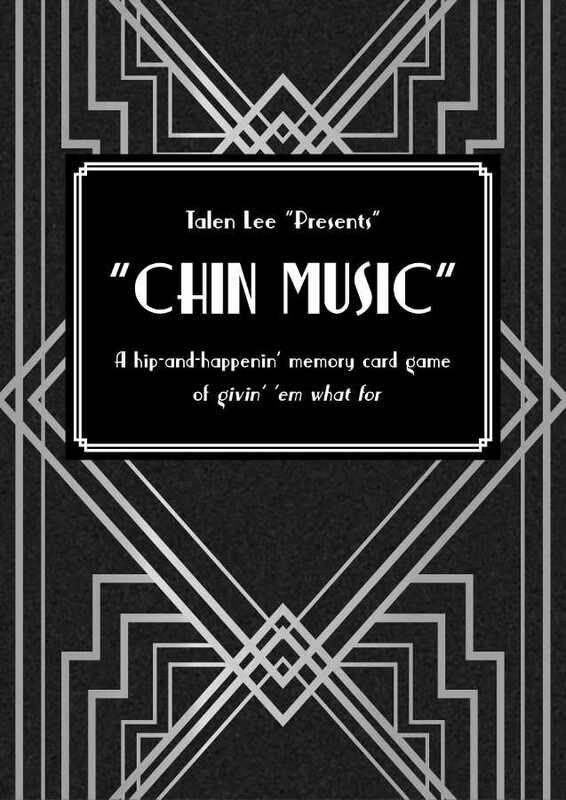 CHIN MUSIC is a short, fast game about memory and pushing your luck. If you’ve ever wanted a game about strings of Olde-Timey Fightey Sound Effectse, like BIFF and BOFFO and WHACK, giving those ruffians a bit of THIS and a bit of THAT, then this is the game for you. CHIN MUSIC contains two facing cards (to look pretty), and 36 cards of sound effects and ruffians. It doesn’t need any counters or dice. CHIN MUSIC is a game without much shuffling. Players do need a small common area, about as much as you’d need to play Snap, and need to be able to see the backs of one another’s cards. You don’t need to do a lot of reading, but a bit of addition is necessary, as is some memory checking. Want to Buy Chin Music? You can now buy our card games directly from this website! If you want to avoid postage costs or try our games out in person, you can also catch us on the convention circuit. For international customers, you may prefer to buy print-on-demand via DriveThruCards (the same printer we use for our local stock). At the moment, we are the only source for this 1.0 version of Chin Music, so contact us directly! If you’re interested in a copy of the 2nd edition, contact us and let us know! Already bought Murder Most Fowl? Download the latest revision of the Chin Music rulebook. You can also follow us to receive notifications of rules updates! Cancon 2018 Post-Game! - Inkspace on Crowdfund This!